Dominions depicts clashes between pretender gods, such as the Virtue seen above. I’d like you to start by telling us about Illwinter Game Design. How did you get started developing games? Johan: My first game was a long time ago just before I moved out to go and study computer science. My favorite old game was Chaos, a game for Spectrum 48 where up to 8 wizards battled it out in a very simple fashion. I got my Atari ST computer after that and felt that you could make a much better Chaos game on that computer. So my first attempt at a game was to create a Chaos clone for the Atari ST, written completely in basic. It got to a playable state and was better than the original in many ways, monsters had hit points and there were more of them as well. But it was not good enough to be sold, so it never got played by other than me and my friends. When I started my Computer Science education I began to create a more sophisticated game that was called Conquest of Elysium. That’s also when I met Kristoffer who joined in and took over the graphics part. Being 2 people helped a lot I think and we managed to finish the game and sell it as shareware. Shareware was the thing back then and I remember that it was really bothersome and crappy compared to how it works today with Desura etc. Illwinter Game Design had started to exist now and we continued to create a new game every few years until we had 3 CoE and now 4 Dominions as well. Peter: Dominions 2 and 3 were originally published as mail-order titles by Shrapnel Games; however, in the last couple of years, you’ve switched to self-publishing (Conquest of Elysium 3, the Steam/download version of Dominions 3, and now Dominions 4). Could you comment on your post-Shrapnel experience? Johan: We are quite happy with post Shrapnel experience. The fact that games are sold online instead of on a CD together with online shops like Desura has made it so much easier to self publish your game. Both Desura and Gamersgate have been great to work with. Steam is also nice, but it is difficult to get your game accepted. 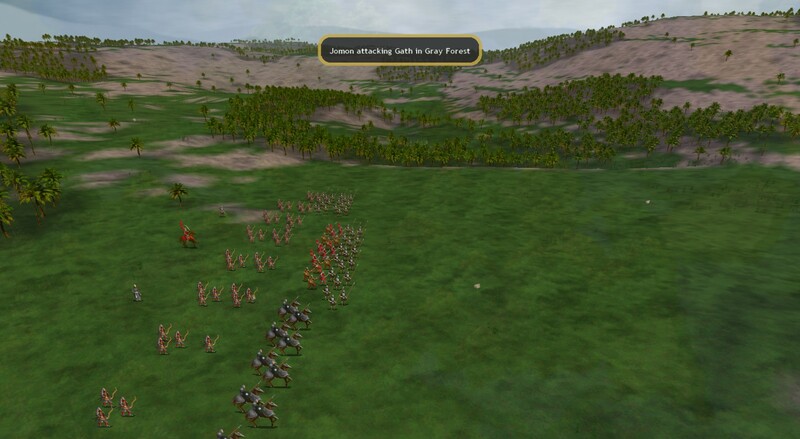 Dominions 3 got accepted just as we were about to release Dominions 4, a little late in other words. An army of samurai, supported by foreign mercenaries, marches onto the field. Peter: It’s been seven years since Dominions 3 came out; what prompted you to create a new Dominions game? What are your goals for Dominions 4? Kristoffer: After developing and patching Dominions 3 for a couple of years we gradually lost inspiration. We wanted to make something new, and Dominions was anything but new. So we started on another game inspired by Star Sonata, but set in a fantasy setting instead of a space setting. Where you built a starbase in Star Sonata, you built a settlement with farms, mines, defences and a wizards tower in our game. You could trade, buy weapons, create expeditions and caravans, research and cast rituals and forge magic items for your heroes and soldiers. With more magic being used the world became tainted and finally there was an apocalypse where horrors emerged and destroyed the world. Hopefully your settlement was by then strong enough to survive the apocalypse and leave an impression on the new and restarted world. Thus we named the game Trade and Taint. We never finished TaT. The goal of the game was quite unclear, and combat was never really smooth. It was sort of turn based made realtime and most battles ended in a few seconds with your hero dead, or victorious, but bleeding to death. So we lost inspiration again and started to remake CoE 3. That felt good and relaxing and was quite fun. When we were finished with CoE 3 we started to talk about a possible Dominions 4. We tried to play a Dominions 3 MP game with some friends and it was really fun. After a while we started to collect possible ideas for a new Dominions. We started off with some major ideas, but soon a multitude of small and interesting ideas emerged. Allied games was one of the first ideas we wanted to implement. I also wanted to redraw all ugly old sprites still left from Dominions 2. That was a gargantuan task and in the end I didn’t manage to redraw all of them. But there are few enough left that I am confident that I will finish them in a few patches. I’m not sure what our goals are. Continue to develop the game and add new nations, pretenders, spells, items and mechanics for a couple of years I suspect. I have about one or two dozen nation ideas, between fifty or hundred pretender ideas, ideas and plans on national items, ideas on mechanic changes and so forth. If we add suggested additions and balance changes from fans, I suspect I could work on the game for several years. That might be too optimistic, but there will be a lot of stuff to work on before I tire and let go of the game. One of the marvellous creatures you might encounter in Dominions. Peter: Illwinter has previously cited inspirations for the Dominions series including Ars Magica, Earthdawn, VGA Planets, Master of Orion 2, and Master of Magic. Did any new inspirations (for the setting, game design, interface… anything) pop up between Dominions 3 and 4? Johan: There is one new game that gave us some new ideas for Dominions 4, the board game War of the Rings. It’s a really good game that has the free people (humans, elves and dwarves) battle Sauron and Saruman. It has fixed teams, one player is Sauron, one is his ally Saruman. On the good side the different factions are divided among the two players. The fixed alliances in this game was a very fun way to play and we wanted this feeling in Dominions too. That’s why we have fixed teams with Gods and their disciples. 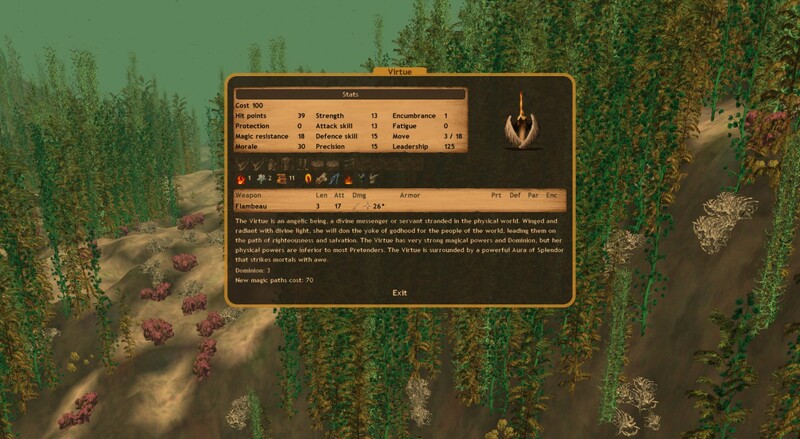 Peter: Out of the new features in Dominions 4, do you have any favourites? Kristoffer: I really like the Thrones of Ascension. They transform a simple victory condition to something meaningful for the competing pretender gods fight over, something of vast powers, something that will make you God. They sets the mood and gives an explanation why the victory condition are important to win the War of Ascension. Their powers are also fun in that they can give you powers you cannot otherwise get. I like them so much I have difficulties restricting the number of thrones I use when I set up my test games, until I realise that I devaluate the glory of the thrones in the game if I add too many. Besides the sense of immersion and tale weaving aspect of the thrones I like the fact that they are used as a victory condition to limit games. Earlier iterations of Dominions often ended in too long end games. 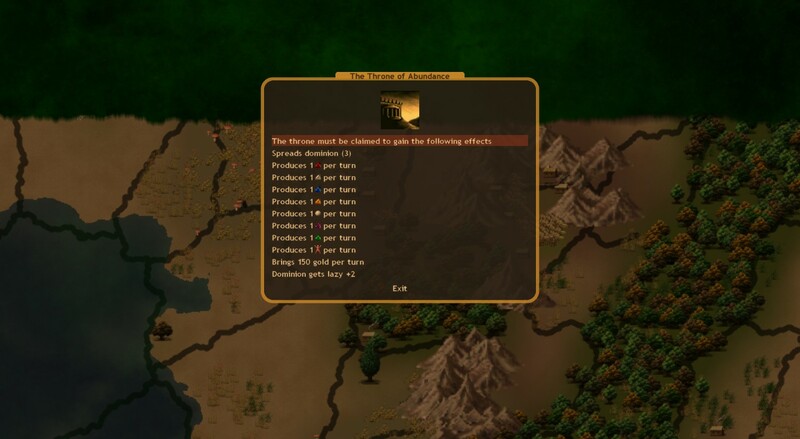 Hopefully this will be less of an issue in Dominions 4. Johan: For me it has to be the disciple game. This is a way to play team games with preset team that fits nicely into the world of Dominions. The can only be one new God, so having different pretender gods work together felt wrong. So instead each pretender god has one or more disciples. Each player controls either a pretender or one of the disciples. The disciples have the same dominion as their god and are affected by it in the same way. So a god with a dominion of heat and death will spread heat and death in his disciples’ provinces as well. It is especially nice with the global enchantments that affect provinces under your dominion, these can then help the entire team at once and encourage the disciples to build many temples. A Throne of Ascension with some unique powers. Peter: Was there anything you wanted to include, but that didn’t make the cut? Johan: We had a few ideas that would require some major changes to the game. These were realtime battles, exact distance 3D map and team game. Team game was the only one that made it. Realtime battles might have been fun to watch, but it would have required a total rewrite of the combat system and I’m not sure it would have made the game better. 3D maps would mean that armies moved freely around the world, not fixed to provinces. This would make speeds and stealth more important and I still like the idea. But it is hard to tell if it would have made the game better or worse, it’s certainly easier to move armies in the current more abstract way. Also a 3D map would have made it into a completely different game and we wanted to fix a lot of small stuff before doing something like that. Peter: Illwinter patched quite a bit of content (such as new nations) into Dominions 3 – any plans for how Dominions 4 will evolve? Kristoffer: There are still a lot of ideas, content and stuff that we want to add. Personally I want to redraw more sprites, add nations, national items and pretenders. So it is likely that we will continue to patch and add content for a couple of years. At first the patches will probably be smaller and more common, with bug and sprite fixes. Later patches will probably contain new nations and mechanics to support them, as well as new modding commands. It would be more fun to do a thematic patch, for example an underwater patch with two new underwater nations and a change to some land nations regarding their ability to enter the sea. Peter: Can you share any of your plans for other games? Kristoffer: We currently don’t have any plans for other games. An update on CoE 3 or perhaps a return to TaT, or a realtime Dominions. For a while we’re content with maintaining and patching Dominions 4. Peter: Thanks very much for your time! 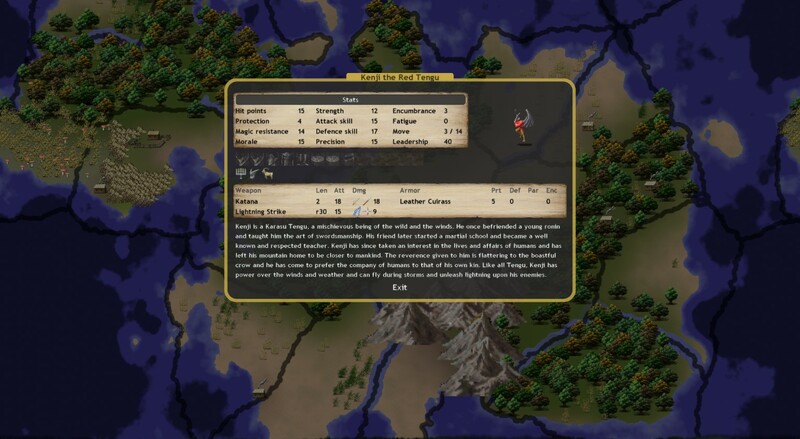 Dominions 4 is currently available as a pre-order beta from Desura. The official release is due very soon – 10 October. All screenshots above taken from a preview build of the game supplied by Illwinter.